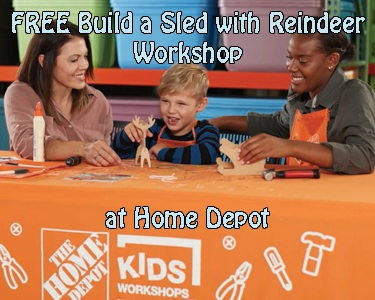 There is a FREE Build a Sled with Reindeer Workshop For Kids at Home Depot on Saturday, December 1st, 2018 9:00 AM – 12:00 PM. Select your store and then register. Dash through the snow in our hands-on workshop where you and your child can build a model sleigh pulled by a reindeer. Once your sleigh is complete, you and your musher can decorate it with paint and stickers and put imagination to work towing gifts around town. All kids get to keep their craft, receive a FREE certificate of achievement, a Workshop Apron, and a commemorative pin while supplies last. Children must be present at the store to participate in the workshop and receive the kit, apron, and pin. The FREE kids’ workshops take place from 9:00 a.m. – Noon. Our team is developing an advanced coupon, deal and Cash Back website that is designed to help savvy shoppers save the most money. We are going to pay our users CASH for posting great deals they find online and for buying deals that other members post. Sign up today to get exclusive access and to help us test the site! We hope to be in Beta by the end of the year! Visit IHaveACouponForThat's profile on Pinterest. Copyright 2019, I Have A Coupon for That. All Rights Reserved.